George A. Ross, 18, of Galloway was arrested on Mar 3 by Ofc. Kevin Welsh for possession of marijuana with intent to distribute and resisting arrest. Mitchell Nolan, 38, of Galloway was arrested on Mar 3 by Ofc. Steven Garrison for hindering apprehension. Terrance Gadson, 27, of Atlantic City was arrested on Mar 3 by Ofc. Daniel Choe for possession of less than 50 grams of marijuana and hindering apprehension. Keith Nelson, 23, of Gallowaywas arrested on Mar 5 by Ofc. Scott Winneberger for possession of marijuana under 50 grams. Michael A. Sigmund, 30, of Galloway was arrested Mar 5 by Ofc. Kerri Baerman on two counts of possession of CDS, marijuana and heroin. Keith G. Reid, 43, of Egg Harbor City was arrested on Mar 5 by Ofc. Ronald Gorneau on a fugitive warrant from Pennsylvania. Xavier Z. Geisinger, 19, of Woodbine were arrested on Mar 5 by Ofc. Scott Winneberger for possession of marijuana under 50 grams. Syed Z. Bukhari, 34, of Galloway was arrested Mar 6 by Ofc. John Mooney for making a false public alarm. Michael A. Horton II, 20, of Atlantic City was arrested Mar 6 by Ofc. Kevin Costa for hindering apprehension. Abdul Abdullah, 18, of Galloway was arrested on March 7 by Ofc. John Mooney for possession of marijuana. Gino Tyus, 48, of Brigantine was arrested on March 7 by Ofc. John Mooney for possession of marijuana and possession of marijuana, possession of marijuana with intent to distribute and obstruction by fleeing. Adam D. Obertlik, 25, of Galloway was arrested on Mar. 8 by Ofc. Ron Gorneau for burglary and theft. Nelson F. West, 20, of Maywood was arrested Mar 8 by Ofc.William Kline for DWI, following a single vehicle accident. Samantha T. Tantleff, 18, of Newton was arrested on Mar. 9 by Ofc. Scott Winneberger for possession of marijuana, CDS paraphernalia and possession of alcohol while underaged. Angel J. Cintron, 25, of Egg Harbor City was arrested on Mar 9 by Ofc. Scott Winneberger for DWI and possession of marijuana. 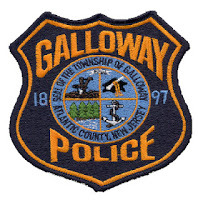 A 17 year old Galloway boy was charged on Mar 3 by Ofc. Steven Garrison for possession of marijuana under 50 grams. Not all but the majority of these arrest seem quasi frivolous and a waste of tax dollars.